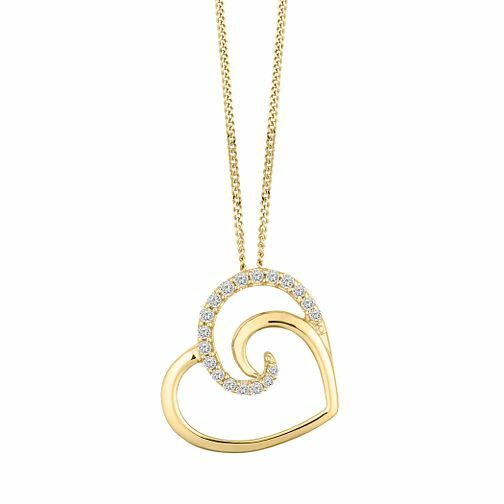 A gorgeous and glamorous pendant, this stunning piece is created from 9ct yellow gold and crafted to present a heart with curved detailings. Embellished with dazzling 0.10ct diamonds, this pendant is sure to steal the heart of the wearer. A beautiful design ideal for gifting to a loved one or treating yourself to! 9ct Yellow Gold 0.10ct Diamond Heart Pendant is rated 4.0 out of 5 by 4. Rated 5 out of 5 by Anonymous from So beautiful! I purchased this heart to match with a pair of heart earrings I already own. The picture on line does not do it justice it is so beautiful. Just the right size (read the description for the size) and the diamonds really sparkle but does not appear "flashy" and to cap it all purchased in the sale - so pleased! !